American actor and artistic director of the Old Vic theatre Kevin Spacey says he feels like "an adopted son" after being awarded an honorary knighthood for his services to British theatre and international culture. The honour acknowledges his 10 years as artistic director at the London arts venue, which ends later this year. He said: "I am honoured and humbled by such recognition from the Queen. I must thank the British public for being so supportive of my efforts on behalf of the Old Vic." He is widely credited with reviving the theatre's fortunes. Earlier in the year, the Oscar-winner was presented with a Special Award by Dame Judi Dench at the Olivier Awards for his outstanding contribution to the theatre. Stars of the acting world also paid tribute to Spacey at a gala event at the Old Vic, marking his departure. Mark Gatiss, who starred in All About My Mother at the Old Vic in 2008, said Spacey had been "amazingly supportive" during the run. "He's done an incredible job, he's totally revitalised this place and it's the end of an era." 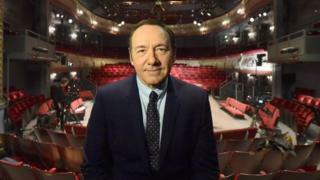 In his closing speech, Spacey referred to the Old Vic's lack of government subsidy asking why the theatre was not treated as "a national treasure". He also said the "best thing about the Old Vic is its future". At the tribute event recorded messages were heard from James Bond director Sam Mendes, former US president Bill Clinton and singer Elton John. During his time at the Old Vic, Spacey has directed two productions and starred in nine. In March, Spacey starred in the one-man play Clarence Darrow. The Telegraph's Domenic Cavendish described his performance as "mesmerising" giving it five stars. Spacey also starred in an acclaimed version of Richard III at the theatre. Guardian theatre critic Michael Billington praised Spacey's "powerful central performance" in the 2011 production, directed by Sam Mendes. The Independent's Paul Taylor described the play as "spine-tingling". "His advocacy of London theatre has been a constant boon, and many of us will miss him as a valued colleague," said Caro Newling, president of the Society of London Theatre. Spacey is now the face of Netflix's popular political thriller House of Cards, playing the ruthless politician Frank Underwood. The role won him an acting Golden Globe this year. The show is an American remake of the 1990 British TV series starring Ian Richardson, based on Michael Dobbs's novels. It has received 22 Emmy nominations and won four awards so far. When it launched in 2013, The Independent's Benjamin Secher described it as "the most remarkable new television drama of the year." Spacey studied drama at the acclaimed Juilliard School in New York City. Actress Elizabeth McGovern, who was at drama school with Spacey, recalled: "He was the brilliant person he is today. We always knew that he had it." His film career began in the 1980s but his break out performance came with The Usual Suspects in 1995, for which he won the best supporting actor at the 68th Academy Awards. In the same year, he played serial killer John Doe in Seven, alongside Brad Pitt, Gwyneth Paltrow and Morgan Freeman. He won another Academy Award for best actor for his performance in 1999's American Beauty, along with a Bafta and two Screen Actors Guild awards. Spacey was previously invested as an honorary CBE for services to drama in 2010.